Doing business in Istanbul, Turkey can feel like doing business in another world. It is simultaneously a city with thousands of years of history and one on the cusp of modernity. Istanbul, formerly Constantinople, was once the seat of the Roman Empire and also serves as the final stop on the legendary Silk Road – a designation that led to the vast array of nationalities and cultures represented within this famous city’s border. A multicultural reality, combined with the globalization of the Middle East in general, means business events in Istanbul require facilitation by language services professionals who can translate and interpret Turkish in addition to any other languages spoken by business colleagues meeting you there. Istanbul has been described as a magical place where East meets West, and it literally does span Asia and Europe. 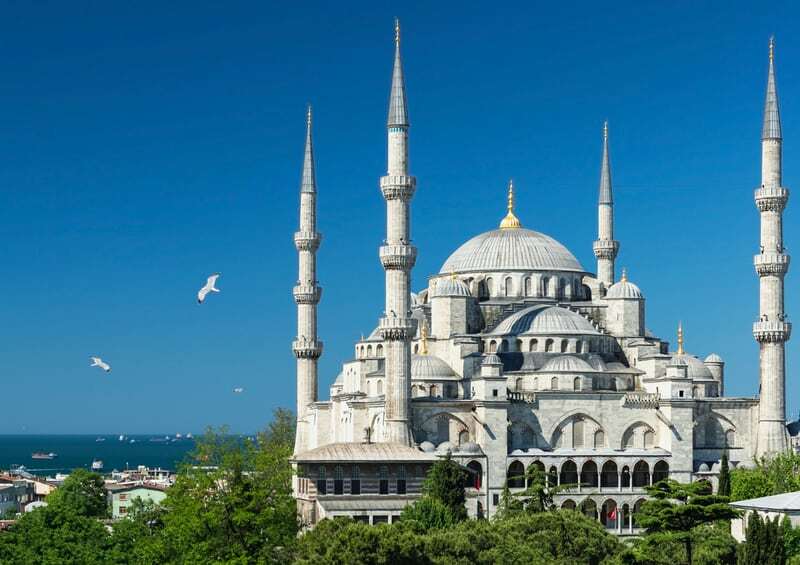 Its stunning architecture, iconic mosques with more minarets than you can count, and breathtaking Byzantine mosaics, provide the perfect setting for conferences, summits, and events. It truly is a place like no other, and this unique change in surroundings and cultures will help to shift your colleagues and clients out of their normal routine and mindsets, opening them up to all of the possibilities your brand’s vision has in store for them. There are a range of conference centers available to you, including the world-renowned Conrad Istanbul Bosphorus and the Hilton Istanbul Bomonti Hotel & Conference Center, for ideal event venues. And Istanbul’s famous sightseeing attractions, such as the Topkapi Palace, the Grand Bazaar, Hagia Sophia, and the Blue Mosque (or Sultan Ahmed Mosque), make it possible for your company to plan a large event that multinational business professionals will never forget. Chang-Castillo and Associates provides platinum-standard language services, including simultaneous and consecutive interpreting, professional translation, teleconferencing and more – all of which will ensure your company’s message is delivered word-perfect, and with respect to the target audience’s cultural sensitivities. We make it our job to assimilate with your team as much as possible, moving fluidly between events and venues and adopting your company culture so everything your clients hear or read maintains the integrity of its original tone, voice, and intent. Contact us online, or call us at +1 (877) 705-0005 to learn more about our language service offerings, and how we can be of assistance to you in Istanbul. As we mentioned above, Turkey is a very unique and culturally diverse country. Within the Turkish population itself, there is significant diversity between those who live in large cities – like Istanbul or Ankara – and those who live in less-developed areas. While Istanbul Turkish is now considered the national language, spoken in the most developed areas of the country and on TV, it’s also true that the population within Turkey speaks a number of other languages, including Northern Kurdish (or Kurmanji). The professional translation team at CCA is very sensitive to these differences and based on our conversation and your target audience, we can produce impeccable translations in both Turkish and other local languages, respecting the preferences of your audience members. Of course, at a multinational event, we’re also happy to provide translations in any language(s) of your choice. Regardless of the size of the translation project, it will go through three separate phases: translation, editing and proofreading – all overseen by one of our experienced project managers (PM). We can also work with your schedule to accommodate rush orders without sacrificing quality. Call CCA at +1 877-705-0005 to speak more about your translation needs. You can also contact us online and one of our project managers will be in touch with you immediately to provide a competitive quote. There is a big difference between community and conference interpreters. Professional conference interpreters are the cream-of-the-crop, and the Istanbul interpreters working for CCA have impeccable credentials, including graduate-level degrees in conference interpreting from accredited universities, hundreds of hours and/or at least five years of conference interpreting experience, plus membership in globally-recognized industry organizations. The interpreters at CCA are more than just language experts; they’re also people and culture experts. They are unrivaled when it comes to taking your company’s words, message, intent, and culture – and transforming them in a way that is both easy for the audience to understand and absorb, while still remaining true to your brand identity. That’s a tricky balance to hold, particularly when we’re talking about the collision of East meets West, and it’s one our interpreters handle gracefully and graciously every time. The result is an interpreting team who never misses a beat when communicating between their team and yours at large events (simultaneous interpretation), and who fits right in with the crowd to facilitate more intimate conversations during smaller business negotiations or at social events (consecutive interpretation). We have no doubt that when you work with CCA, we’ll form a life-long business relationship. You’ll notice the difference it makes when your company can communicate with an internal, connected and nuanced understanding of how messages will land with an international audience. Don’t forget to ask us about our language services packages, which combine professional interpreting with translation or any of our other services for a competitive price. Give us a call at +1 (877) 705-0005, or contact us online to begin planning your needs. While many conference venues advertise a range of equipment offerings, we don’t recommend trusting your important work to interpreting equipment you don’t have control over. Missing equipment, static, disruptive feedback and poorly-filtered background noise (not to mention technical malfunctions) quickly take their toll on any event and your ability to communicate with the audience. When you work with CCA, we’ll provide top-quality rental equipment, including UN-style soundproof booths, headsets and mics, portable equipment for tours and demos, interpreter consoles, and more. This all comes paired with an onsite technician, who will guarantee everything is working perfectly so your event can move forward without a hitch. We also offer innovative teleconferencing solutions. Compatible with the presentation software of your choice, teleconferences offer the ability to engage in a more personalized way with colleagues, prospects, and clients. Have an international prospect who couldn’t get to Istanbul? Include them using teleconferencing technology. Plus, teleconferences enable you to continue the conversation – and professional relationship-building – after everyone’s gone home. The team at Chang-Castillo and Associates looks forward to contributing exceptional language service solutions at your upcoming events in Istanbul, Turkey. Contact us to begin the collaboration. We’ll show you what it looks – and feels – like to work with the platinum standard in professional interpretation and translation.